I used to be so reckless with sunscreen. Before my mid 20s, I only used it at the beach (read: never. Going to the beach is my idea of hell – I know, weirdo). The few times I was dragged there, I would begrudgingly put sunscreen on, and then leave the bottle lying wherever. In the car, on the sand under the scorching sun, on my bed… Who cared? Well, I wish I did care. 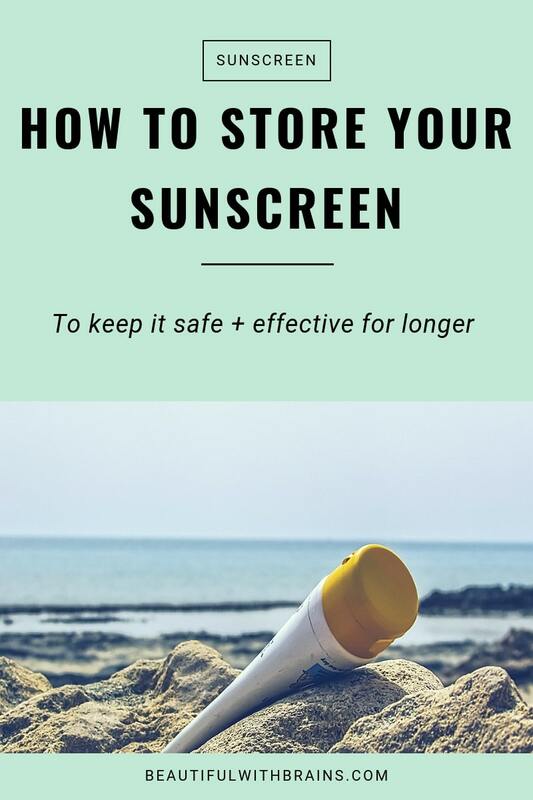 The way you store sunscreen matters. Do it wrong, and it loses all its effectiveness. The worst part is that you often don’t realise there’s something wrong with it until you get a bad sunburn. Ouch! So, how should you store sunscreen? I used to keep all my skincare products in the bathroom, because it’s SO convenient. Too bad it’s deadly for all your lotions and potions (sunscreen included). Here’s the deal: the temperature in the bathroom changes all the time. Think about all those warm showers you’re taking. They make the temperature rise up, and then it goes back down, and then back up again. All that warmth and humidity can make your fave products turn mouldy and go bad soon. It’s convenient to store our sunscreen in the car, isn’t it? That way, you have it with you everywhere you go. But, if it’s a hot day and you park your car under direct sunlight, you’re pretty much storing your sunscreen into an oven. Actually, if the day is really, really hot, the car will turn into an oven regardless of where you park it. Do bring your sunscreen with you, but be careful not to “cook” it, or you’ll have to throw it away! I used to let my sunscreen lie around wherever, including my bed and my desk, which were often under direct sunlight. Basically, they were the hottest spots in the house. Not smart, Gio! Of course, this isn’t as bad as storing sunscreen in the car as the temperature won’t rise as much. But, if you want your sunscreen to work its best and last that little bit longer, avoid any place that’s under direct sunlight. So, Where Should You Store Sunscreen? Always store your sunscreen somewhere cool, dark and dry. I keep mine in a drawer in my bedroom. It fits the bill well, especially in London, when the weather rarely gets that hot. Still, I always put a bag of silica gels in there, just to keep the drawer dry. Silica gels are great at absorbing the excess moisture caused by humidity that would make your sunscreen (and everything else) go bad quickly. Forget about bathrooms and cars. If you don’t want your bottle of sunscreen to go bad quickly, store it in a cool, dry, and humid place. No excuses. Where do you store your sunscreen? Let me know in the comments below. Can you mix the same spf sunscreen? Like go 50/50 with 2 brands that you have? Can ya layer spf? Not to add spf since ya cannot, but just say you have a spf 30 primer,spf 30 bb cream and a spf 30 sunscreen, as long as you use enough product (1/4 tsp.)? Like why use 1/4 tsp alone of just the normal sunscreen if the other products contain spf? Like use a 1/3 of each to get enough protection,for example instead of solely reling on your sunscreen? Like also say the chemical/or mineral actives were the same? H, mixing two sunscreen is very tricky, especially if they have different sunscreen ingredients or the same sunscreen ingredients in different amounts. You may be seriously compromising their effectiveness. And, it doesn’t matter how many products with SPF you use, you only get the protection the products with the higher SPF gives you. And if you use only a 1/3 of this and 1/3 of that, you only get the square root of the higher SPF! So, just use sunscreen, and ignore other products with SPF, or, at least, don’t rely on them for sun protection. What if both products use the same active ingredients and both have the same spf? Like I have this one sunscreen that can be a bit oily and this one that can be very drying,and would love to mix them. That’s true about the actual spf only being as high as the highest spf number you’re using,but if they were all the same spf number could you all use a bit of each to get through protection? We need 1/4 tsp. of sunscreen total. What if we used 1/3 of a 1/4 a tsp. spf 50 primer ,a 1/3 a 1/4 tsp spf 50 sunscreen, and 1/3 of tsp of spf 50 cc cream. Total of 3/3 of 1/4 tsp = 1/4 tsp., so you’d have the required amount of sunscreen. Would that work (assuming they all have the same actives,like zinc)? It’s not practical to use a 1/4 tsp. of each, or using that amount of sunscreen but getting extra spf. protection that’s not giving you a higher spf on top! Oh, I see. If two sunscreens have the same active ingredients and same spf, I’m pretty sure it’s ok. But, they must be sunscreens. Cosmetics with SPF don’t provide adequate protection. You need to apply too many layers to achieve the SPF stated on the bottle, so using just sunscreen is easier in the end. I never much liked sunscreen, so far the ones I have tried (supermarket brands): the texture is gross, and my skin looks waxy or pasty.. (I don’t wear foundation often). at the moment I am using an argan oil sunscreen called “Facial Sunscreen Organic Argan Oil Ecran Total SPF 50” .. it’s not so greasy, and becomes matt but I still can’t get away from a waxy texture on my face making me feel like I should be on display in a wax museum. can you recommend something lighter? also, is there a particular stage in the daily routine face care steps which is ideal to apply the sunscreen? I like to apply chemical sunscreens to bare skin and mineral sunscreens last. Hope this helps. Dinah, sunscreens are tested to withstand instances like this. As it was only 20 minutes, I don’t think it did much damage. Had you left it there for a few days, then I would have worried. How about storing them in the fridge? I live in a very hot country with a dry climate where the temperature inside the house is often above 28 degrees Celsius in the summer. Is the fridge a better option to keep lotions and sunscreens cool or is it too humid to be beneficial (or possibly detrimental)? Suz, yes, you can store it in the fridge.